In 1987 I closed a project focused on seascape abstractions that began in 1972 in Main, Rhode Island and Cape Cod; the Atlantic shore. See the Archive for images. This was a project that was too long in the running and had mannered out for me. Financially and commercially it was a very successful run. However, I needed to move on. I felt at the time that I needed to return to my roots. I believe, upon reflection, I was correct in 1987. 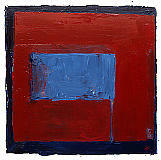 I reopened some painting ideas left undeveloped from the late 1960's and early-to-mid 1970's. 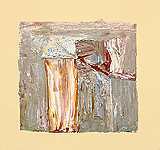 I spent a few months in late 1987 and early 1988 working on paper and canvas with brush and paint, Abstract Expressionism, Lyrical Abstraction, and minimalism; kind of mushing it altogether. My response was… eh! I felt lost and was experiencing a profound déjà vu. After I completed a painting session, I would clean my tools and palette by spreading the unused goo onto small pieces of paper. My original intention was to possibly use these small colorings as collage elements in other work. However, I liked the image structure showing up on these small papers; ca 2 x 3". I quickly began making larger paintings on paper using only scraper-like tools; painting knives and taping knives. The program then graduated to canvas; some on a large scale. Texture and thick paint was a consideration I explored vigorously. The medium is acrylic polymer on cotton canvas. 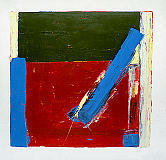 7) CP1SF1, 1989, Acrylic/Canvas, 40"h x 43"w"